Birthday card, Anniversary card, Retirement card, Remarkable achievement card. Celebrate you! Celebrate everything! This is a very versatile design. Make it your own; keep the numbers, remove them and add some words. 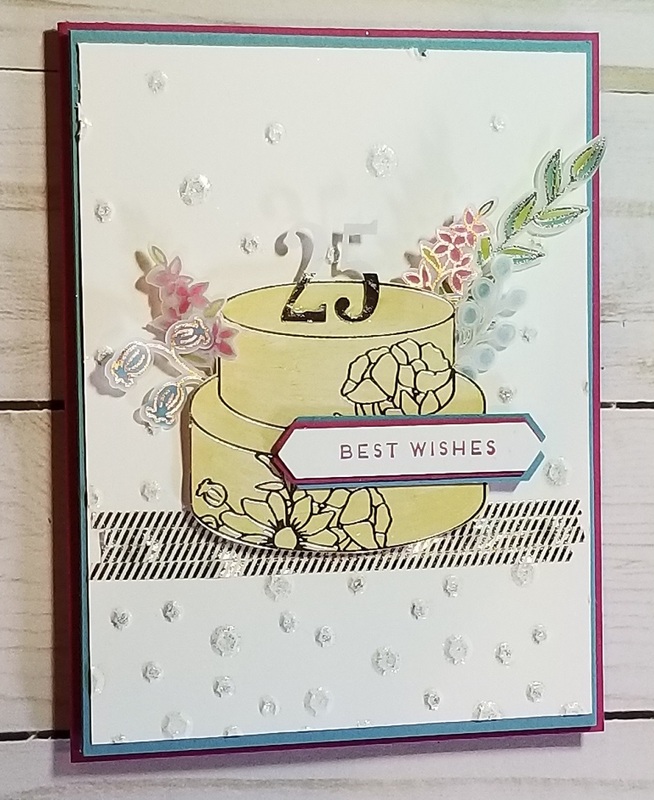 You can do that with the Labeler Alphabet stamp set and some scrap cardstock. There are lots of designs in the embellishment kit that can be swapped for the ones shown here. Run the WW through Bigshot in the Scatter Sequin Dynamic folder, then use the Wink of Stella to highlight the sequins and set aside. Select vellum flowers & leaves from the embellishment kit and use the blender pen to pick up color from the various ink pads and color the vellum. Stamp sentiment on WW 1”x3” and punch out with Classic Label punch. Punch the Berry Burst & Marina Mist 1”x3” with Classic Label punch – cut these in half lengthwise. Use the multipurpose glue to adhere MM to back of WW with a very thin border and repeat with BB. Apply dimensionals to back of the cake punch out and adhere to WW layer slightly over the Washi Tape. Use glue dots to adhere the vellum florals behind the cake. The numbers are optional. Adhere the sentiment over the cake (offset) with glue dots. Adhere WW layer to MM layer with the snail, then use dimensionals to attach to the BB card base.